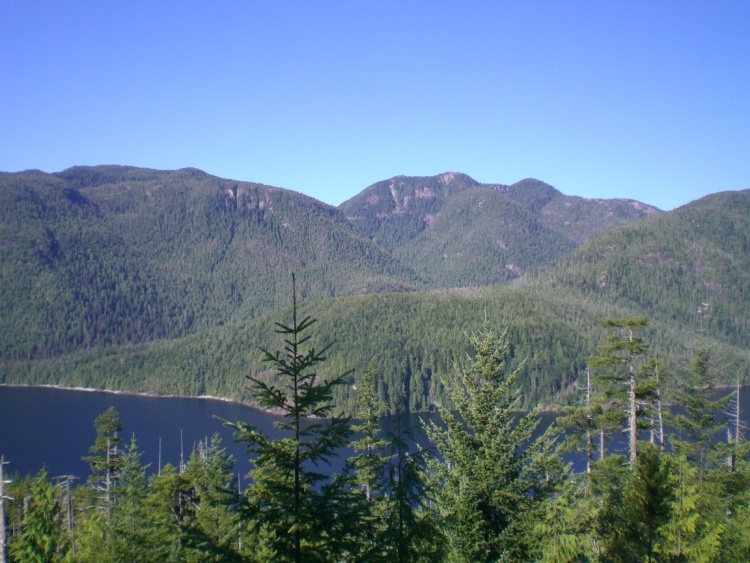 Thunderbird’s Nest/T’iitsk’in Paawats Protected Area was established in the spring of 2011 as a result of obligations detailed in the Maa-nulth First Nations Final Agreement. This protected area protects T’iitsk’in Paawats which is a sacred and spiritual place for the Uchucklesaht Tribe and the Nuu-chah-nulth First Nations. T’iitsk’in Paawats translates to “Thunderbird’s Nest” and is where the last remaining Thunderbird lives. Thunderbirds are creatures of tremendous importance to the Uchucklesaht Tribe and Nuu-chah-nulth First Nations. They control the rain and thunderstorms and they are connected to whales, whaling and whaling power. The protected area is a natural place of old growth forests without any permanent structures. The T’iitsk’in Paawats is made up of creeks, bathing pools, waterfalls, archaeological sites and five named mountains (Tuutuuchpiika – ‘Thunder Mountain/Eldest Brother’, Titskakuulth - ‘Thunder Face Mountain’, Uusajuu-is – ‘Ritual Bathing Mountain’, Uu-aatsuu - ‘Second Eldest Brother Mountain’ and Kalthaatik – ‘Youngest Brother Mountain’). The spiritual sites within the T’iitski’in Paawats are places that Uchucklesaht people go to ‘osimich’, a process crucial to the proper preparation for persons seeking to cleanse themselves spiritually. Leave detailed information of your plans and your estimated arrival time home with someone responsible. Please practice “Leave No Trace” hiking and camping ethics in the protected area. Bears and cougars are common in this area and visitors are reminded to be bear and cougar aware. Thunderbird’s Nest/T’iitsk’in Paawats Protected Area and adjacent Uchucklesaht Tribe’s land are Uchucklesaht Tribe sacred and spiritual places. Visitors are asked to respect the cultural significance and special nature of these areas. The protected area is a rugged wilderness area with no facilities and visitors wishing to venture into the area need to be entirely self-sufficient, properly equipped and experienced. Anyone planning to visit the protected area is asked to get updated access and area information by contacting Uchucklesaht Tribe at 250-724-1832 or visit their website at http://www.uchucklesaht.ca/. Thunderbird’s Nest/T’iitsk’in Paawats Protected Area is located on the western shore of Henderson Lake near the mouth of Uchucklesaht Inlet on the Alberni Inlet approximately 38 kilometers southwest of the Port Alberni on Vancouver Island. Access to this remote Thunderbird’s Nest/T’iitsk’in Paawats Protected Area is currently by several options which includes by road, water, foot, and/or bicycle. By road from Port Alberni to Elbow Creek: from Port Alberni follow approximately 60 kilometres of forest service road to the east shore of Henderson Lake and Elbow Creek. There is a rustic boat launch at Elbow Creek. From Elbow Creek, there is a 2-kilometre boat trip across Henderson Lake to T’iitskakis – Thunderbird Beach on Uchucklesaht Tribe land. The protected area can be accessed following a very rough trail following T’iit’iiskakis – Thunder Creek. By road from Port Alberni to the Uchucklesaht Village of Ehlhateese: from Port Alberni follow approximately 60 kilometers of forest service road to Ehlhateese. From Ehlhateese, there is a 2-kilometer boat trip across the Uchucklesaht Inlet to Silverside. The protected area can be accessed by following Silverside Road for approximately 15 kilometres hiking, mountain biking or by ATV. By boat from Port Alberni to Silverside: from Port Alberni by boat down the Alberni Inlet to Silverside. The protected area can be accessed by following Silverside Road for 15 kilometres hiking, mountain biking or by ATV. The access road to Henderson Lake is an active logging road and is maintained by Western Forest Products. For current information on active logging in the area, contact them at www.westernforest.com. Be advised that Henderson Lake is a large dangerous lake where weather and the lake conditions can change quickly at any time. Conservation: As a result of Maa-nulth First Nations Final Agreement the T’iitsk’in Paawats was protected to preserve important cultural and ecological values. The protected area protects a mostly wilderness landscape, which contains representative natural features associated with the Coastal Western Hemlock biogeoclimatic zone and the area is recorded as one of the wettest spots in Canada. The protected area can be accessed by canoe or kayak from Thunderbird Beach across Henderson Lake from the Elbow Beach Boat Launch. Bicycle helmets are mandatory in British Columbia. Bicycles can be used to access the protected area from Silverside following an old logging road. Anyone fishing or angling in British Columbia must have an appropriate license. Various species of trout and salmon can be found in the waters of Henderson Lake. Fishing is permitted as per provincial and federal fishing regulations. A rustic steep trail follows Thunder Creek from Thunderbird Beach and provides access the protected area. A 15-kilometre old logging road from Uchucklesaht Inlet provides access into the protected area. Anyone planning to hike into the protected area is asked to get updated information about the area and access by contacting Uchucklesaht Tribe at 250-724-1832 or visit their website at http://www.uchucklesaht.ca/. Visitors’ are asked to conserve the environment in the protected area by minimizing the use of fire. Campfire bans may be implemented during the dry season be prepared by bringing a potable stove for cooking. Bring your own drinking water, as potable water is not available in the protected area. Wilderness camping is allowed, but no facilities are provided. Please practice “Leave No Trace” camping ethics. This protected area is accessible year-round.